They may not win a lot, but no one can say the Colorado Rockies have been dull. Playing a distinctive "mile high style" of baseball in a pinball machine of a ballpark, they (and their opponents) have been lighting up scoreboards - and pitchers - for almost two decades. Those who spent years (and in some cases decades) trying to lure a major league franchise to Denver argued that their city was hungry for Major League Baseball. Their vision became realty when Denver was awarded a franchise in 1991, and their arguments vindicated two years later when the Rockies played their first game in front of more than 80,000 fans, the largest opening day crowd in baseball history. The Rockies won that game against Montreal 11-4, the franchise's first major league win. They had lost their first two games to the Mets at Shea Stadium, 3-0 on April 5 and 6-1 on April 7, 1993. In their first two seasons the Rockies played to more than 7.7 million fans at Mile High Stadium. They had 52 crowds exceed 60,000 and 21 times exceeded 70,000. This was not lost on Rockies ownership, which had broken ground on Coors Field in 1991. Originally designed to accommodate 43,000, they quickly redesigned the park to accommodate more than 50,000 before its 1995 opening. The "mile high style" of baseball comes courtesy of the thin air at Denver's altitude. According to the Coors Field web site, scientific studies show a baseball hit 400 feet in New York (sea level) will travel 10 percent farther in Denver, or 440 feet. The result? A "mile high style" of baseball where runs and home runs come cheaply, punch-and-Judy hitters become sluggers, no lead is safe, and final scores sound like the teams had field goal kickers instead of batters in their lineups. The mile high style" broke new ground in 1999 when a record 303 homes runs were launched at Coors Field and the average score was 8-7. The Rockies have parlayed "mile high style" baseball into seven winning seasons. They have earned three wild card appearances, their first in 1995 in only their third season. Their lone National League pennant and World Series appearance came in 2007 when they lost to Boston. Their most recent postseason appearance came in 2009. Their short history has not prevented the Rockies from setting some impressive offensive numbers. They have had six batting champions and three home runs champions in their first 18 years. The franchise record for home runs in a season is jointly held by Larry Walker and Todd Helton at 49, and Andres Galarraga holds the RBI mark at 150. "Mile high style" baseball has taken a heavy toll on the Rockies pitching staff. Many years their staff earned run average has been above 5.00. However, hard throwing right-hander Ubaldo Jimenez has shown that pitchers can succeed in Coors, with a 19-8 record and a 2.88 ERA in 2010. With a 50-36 career record, Jimenez is quickly moving up the list among Rockies all-time victory leaders. One reason pitchers struggle in Coors is the thin air that prevents breaking pitches from having their usual bite. This has also scared away potential free agent pitching talent, and made those free agents who did sign with Colorado regret it - see Mike Hampton and Denny Neagle. The "mile high style" may be exciting and the Rockies may wind up setting every offensive record in the books. But it exacts a great toll on pitchers and the teams' overall ability to win. It's a classic case of dying by the same sword they live by. On May 3, 2000 , the Colorado Rockies set a team record for hits during a game with twenty-four versus the Montreal Expos . 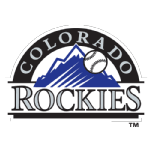 The Colorado Rockies set a team record for runs scored during an inning with eleven in the seventh inning on July 12, 1996 , versus the San Diego Padres . Did you know that on April 9, 1993 , the Colorado Rockies set a team record for attendance on an Opening Day game when 80,227 fans came to see the first game ever at Mile High Stadium?